On the centennial of the great W.C. Handy song "The Yellow Dog Blues," participate in a Studio 360 listener challenge. This project was published in the evening, California time, on Thursday, May 22, with 11:59pm on the following Monday, May 26, 2014, as the deadline. This week we’re going to cover a 100-year-old song. 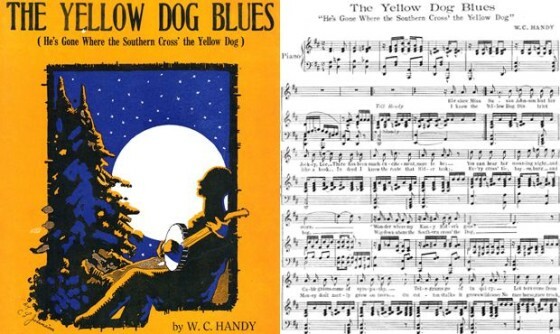 In honor of the centennial of W.C. Handy’s “The Yellow Dog Blues,” the radio show Studio 360 is holding a contest, inviting people to upload to SoundCloud their original rendition of the song. Step 2: Record your version. Studio 360 says, “Cover the song in any style, with any instrumentation; as traditional or as radically different as you’d like.” No, you don’t have to sing; it can be an instrumental version. Step 3: In addition to posting your completed track to the Disquiet Junto group, upload your track to https://soundcloud.com/groups/1914-blues-challenge. Note: The deadline to be considered for the Studio 360 challenge is Sunday, June 1, at 11:59pm Eastern Time. So, if you want to just use this Junto project as a test run, you can wait until later in the month to upload a finished version to the Studio 360 group. Deadline: Monday, May 26, 2014, at 11:59pm wherever you are. Length: Your finished work should likely be between a minute and a half and four minutes, but there’s no formal length requirement. Title/Tag: When adding your track to the Disquiet Junto group on Soundcloud.com, please include the term “disquiet0125-junto360blues” in the title of your track, and as a tag for your track.